Tactical Issues: How will the Raptors and Magic adjust in Game 1? The Raptors and the Magic have some tactical adjustments to make heading into Game 1 of their opening round series of the 2019 NBA Playoffs. Here are some issues both coaches need to answer for their respective teams. Share Tactical Issues: How will the Raptors and Magic adjust in Game 1? With tip-off in a few hours, it’s time to assess the probable tactics of both Raptors and the Magic. Most predict that Toronto will have a relatively easy time with Orlando — our official position: Raps in 5 — but that doesn’t mean the Raps don’t have to prepare. As you’ll recall, last season I reviewed strategies that opposing teams used against the Raptors. Part of the process was determining whether it was effective or not, and how the other team might (or should) respond. I also offered post-game suggestions — which were wrongly ignored! — but were offered nonetheless. I hope to continue to do the same throughout the rest of the Toronto Raptors’ post-season run in 2019. 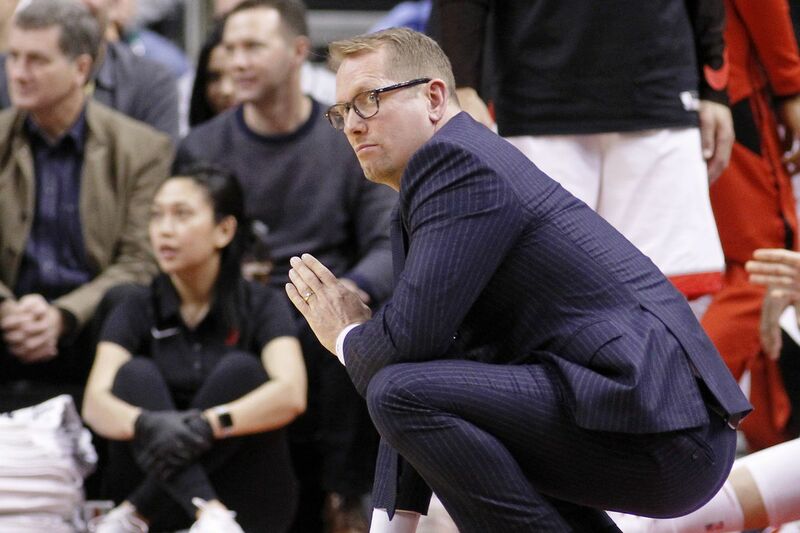 First up, let’s go over some key tactical considerations for coaches Nick Nurse and Steve Clifford, and how things could or should change throughout the series. I know there’s a lot of noise in terms of what’s useful or not based on the regular season series against the Orlando Magic. But as a primer there are some initial burning questions that I believe will determine how each team will approach the next few games. Where Will the Magic Hide D.J. Augustin and Evan Fournier? Through their first three meetings, the Magic were not comfortable with Danny Green attacking Evan Fournier in the post (or anywhere inside the arc), so on the fourth and last meeting of the regular season, the Magic decided to put Augustin on Danny Green. Nick Nurse countered by running plays for Green where Augustin had to chase him around the perimeter. In the process, Green open quite a bit beyond the arc and just fired away over Augustin. In that last contest, Danny shot 7-of-10 from three, finishing with 29 points. As a result: I would expect the Magic to go back to having Fournier guard Green. How Can the Raptors Unleash Pascal Siakam? Jonathan Isaac has been a tough match-up for Pascal Siakam during their season series. Spicy P struggled against Isaac’s excellent combination of length and quickness, which Isaac used to negated Siakam’s ISO from the outside of the three-point area. Against most other opponents, Siakam has been able to dance around and spin in for a layup, or just go to work straight away in the post. Isaac was able to slow both of these options for Siakam. As such, there are a couple of adjustments we can expect from Siakam. First, he’ll need to keep the tunnel vision feel out of his ISO/post-ups. To help with that, Nurse can sprinkle in some off-ball movement around the play for Siakam to have an option to play-make. It’s hte kind of advantage he’ll need to get himself going. I’m suggesting the off-ball movement part mainly because the Magic are guarding Siakam straight up — and they’ve shown they can do that — so there are no passing angles for him because they’re not collapsing on him. The second logical option: getting Siakam his touches via off-ball cuts to the basket with Marc Gasol as the main distributor. Double-Team Vucevic — Yea or Nay? Nikola Vucevic in the post is a problem. If he’s down there with Serge Ibaka guarding him, Nurse will likely have to send someone — like Siakam — to double-team him. However, Vooch knows where his shooters are, and, at least against the Raptors, had demonstrated that he’s aware of where the double teams are coming and where to kick the ball out. Vucevic probably won’t post-up Gasol that much, and when Gasol is on the floor the Magic will run a pick-and-roll action between Augustin and Vooch. In the event that Gasol switches to Augustin, Siakam has always been on standby to immediately switch with the guard that would have to cover Vucevic. The Magic seems prepared for this counter, as they are OK with letting their centre post Siakam up. Vucevic has also shown the ability to pass over to Isaac, who in this case is left wide open for a corner three. In all, these are the choices the Raptors are going to have to make with regards to Vucevic in the post — double-team him, watch his roll, or stay home on shooters. How Will the Raptors Defend the Augustin-Vucevic Pick-and-Roll? The Raptors defense broke down more often than not when Augustin and Vucevic ran their pick-and-roll play. Because of trades and injuries, it’s been hard to assess exactly how the Raptors will defend the play now. In the previous games between these teams, the Raptors had a hard time communicating and getting their defensive rotations right — up until recently. The Raptors tried to use zone defense a few times to stop this kind of action, but the Magic were ready to counter this by running their Horns set play. When that happens, Vucevic immediately slips to the basket as soon as the point guard passes the ball to Isaac for a quick high-and-low play between Isaac and Vucevic. It’s proven to be quite effective. Still, the Raptors’ defense looked significantly better based on their last game against the Magic, with Gasol now more firmly integrated with the team. Here’s hoping that particular trend continues. Aaron Gordon: A Discount Blake Griffin? The Magic’s offense has a lot of intricate ways to get Aaron Gordon in positions where he can patiently dribble around the paint and become a triple threat on offense. In this mode, Gordon can hunt for a pass to Vucevic down low, or a kick out around the perimeter, or even take the shot himself if it’s clear enough. Against the Raptors, this strategy looked good for the most part, especially when the Magic’s perimeter players are hitting their shots. It’s a luxury for coach Clifford to be able to run their offense off Gordon’s budding playmaking, and with the Magic’s size advantage there’s no reason why they shouldn’t go with this strategy often enough. Keep in mind here: the Raptors are down two extra long and strong defenders in OG Anunoby and Pat McCaw, so it’ll be interesting to see how they keep up with the Magic’s athleticism over the length of the series. Reset Play with Marc Gasol at the Elbow? Nurse hasn’t done this a lot, but rather than having Kyle Lowry, Kawhi Leonard, Fred VanVleet, or Norman Powell go ISO from behind the arc to salvage a play with the clock winding down, why not try Gasol? The Raptors have found some positive returns in giving the ball to Gasol at the elbow and letting him create something out of nothing. The Magic’s defense looks like it’s much more prone to collapsing in these situations than having all eyes on the ISO ball from outside of the three-point line. When you add in Gasol’s relative savviness relative to the Magic’s inexperienced front line, it could be a real advantage for the Raptors to exploit. It’s really hard to gauge how the Raptors will play the Magic defensively right now. The regular season games mean next to nothing, given the changes with Toronto. But the Magic are who they are, and they seemed to have a lot of success offensively throughout the regular season against the Raptors, if not for the entire season. Whether the “real” Raptors defense is what we saw between the second and third quarter of their final game remains to be seen. But it’s something Toronto will need to make their mark on this series with the Magic. Why do the Basketball Gods continually taunt the insecure Raptors fanbase? Five thoughts on last night’s Game 3: Raptors 98, Magic 93 A struggling Kawhi Leonard and an unfriendly whistle conspired to keep the Magic in the game, but Pascal Siakam was too much for the Magic. Game 3 Turning Point: The Raptors put together a 16-0 run to take control There was the Lowry hustle play late, but the real turning point in Game 3 came when the Raptors re-asserted themselves over the Magic in the third and took control of the game. Game 3 Analysis: Pascal Siakam carries the weight for Toronto Despite a couple of close calls, the Raptors hung on in Orlando to win Game 3 against the Magic. And the story this time has to be the superlative play of Pascal Siakam. Kawhi and Gasol are the dads the Raptors have been searching for Kawhi Leonard and Marc Gasol provide the kind of adult energy the Raptors have been searching for in the playoffs for years. In Game 2, the value of the team’s two new fatherly souls was on display. Raptors overcome the Magic in Game 3, 98-93 Through a loose whistle and a tough night for Kawhi Leonard, the Raptors found a way to win and take back home court advantage in their first round series.